This will hopefully be a fairly simple "stand-off scale" profile build for 1/2A control line. I've thought about it for several days.. and started scaling today. I don't really know how to scale "properly".. but this will be as close to 1/2"=1 foot as I can get. 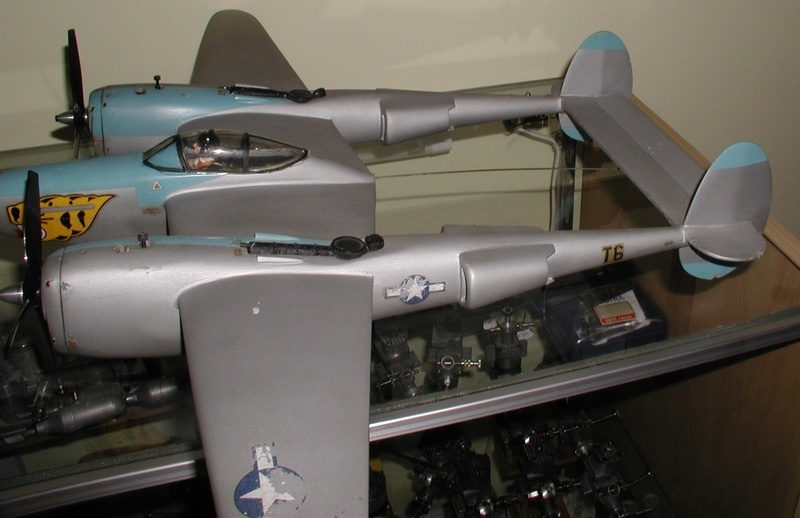 The P-38 has a 52' wingspan.. so that works out to 26".. which is what I had in mind for Cox .049 reed-valve power. It will be a simple slab-wing. 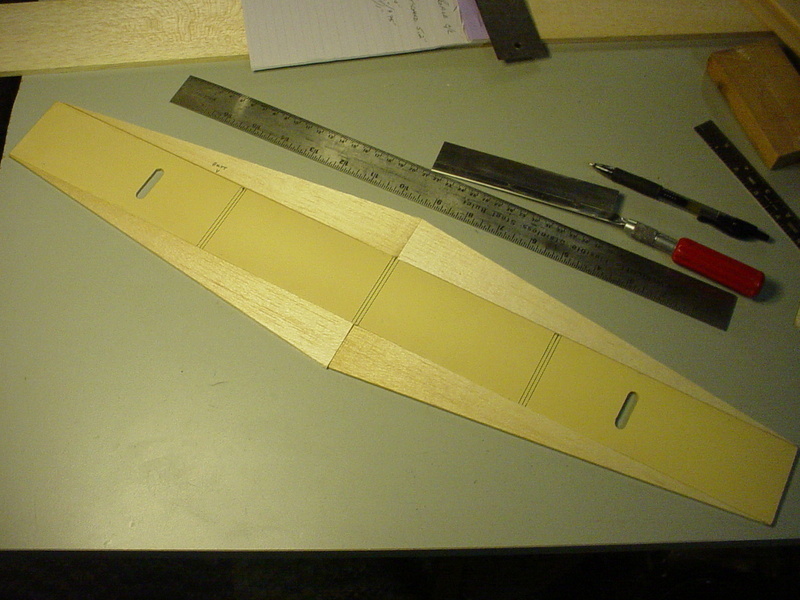 1/4" sheet balsa for nacelles/booms/central-pod, and 1/8" sheet balsa for wing/stab./elev./rudders. 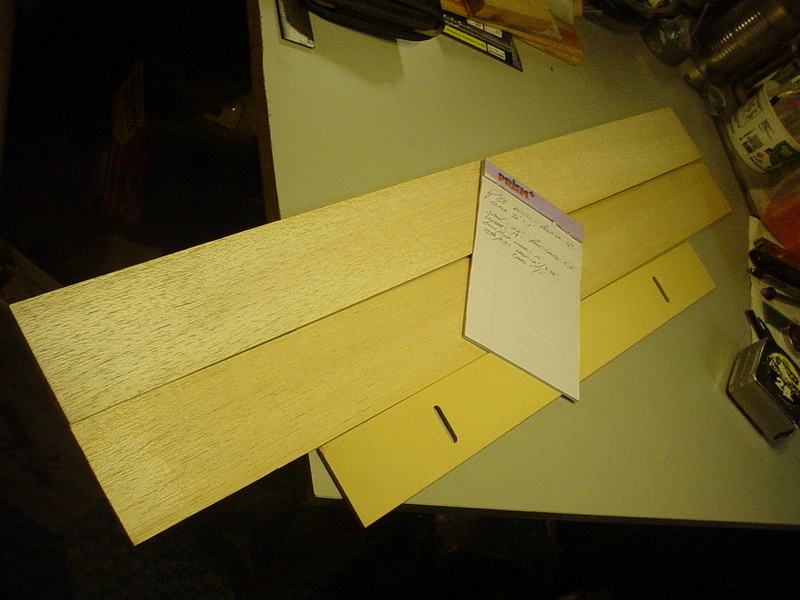 Wing will have a 1/8" sheet basswood spar made from one of my window-blind slats. Hello Roddy!! 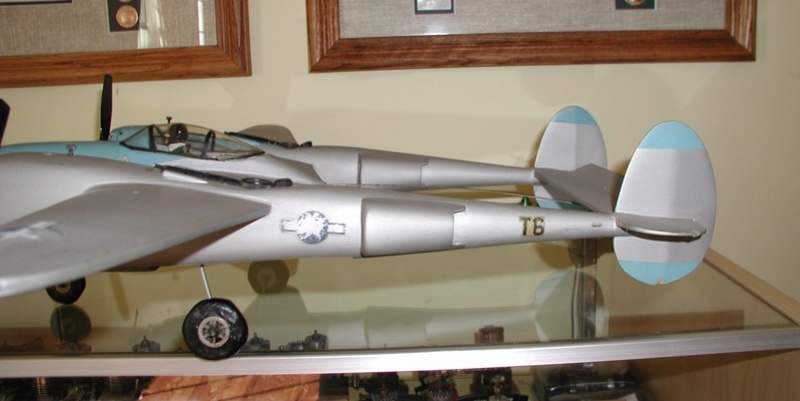 I am glad to see you starting another project and the P 38 as always been one of my favorites. 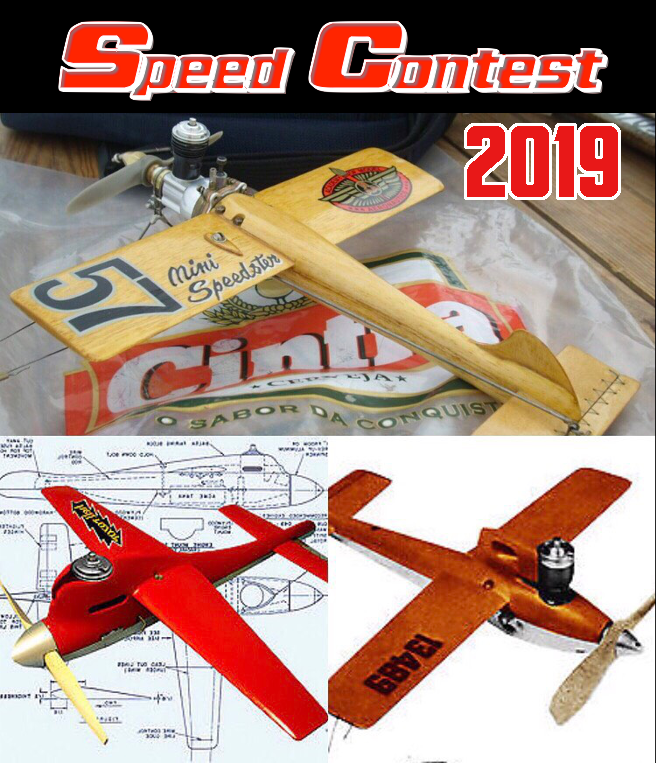 Sooo I've been building something for the speed plane contest although I doubt I can ever fly it! I'll try to post some pictures when the paint is done. 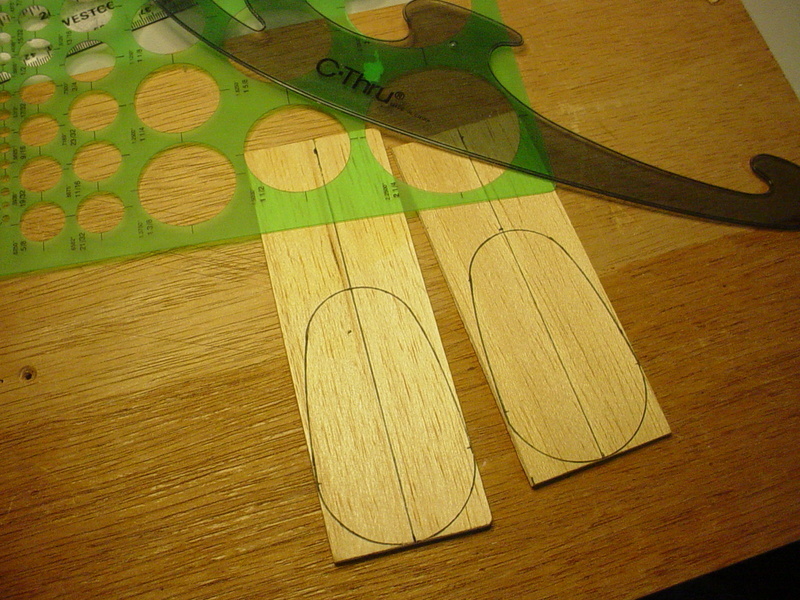 Where do you buy your balsa wood? I placed a large order from Sig and its been on back order for the last 2 weeks. I have a couple of new planes to work on and need it soon!! Root-chord is approx. 5.2". The taper looks to be symmetrical between the L/E and T/E.. so that's what I went with. The wings' core is 1/8" sheet basswood (2.375" x 24.0") which will be a bit heavy.. but I wanted some strength to span the nacelles/booms. 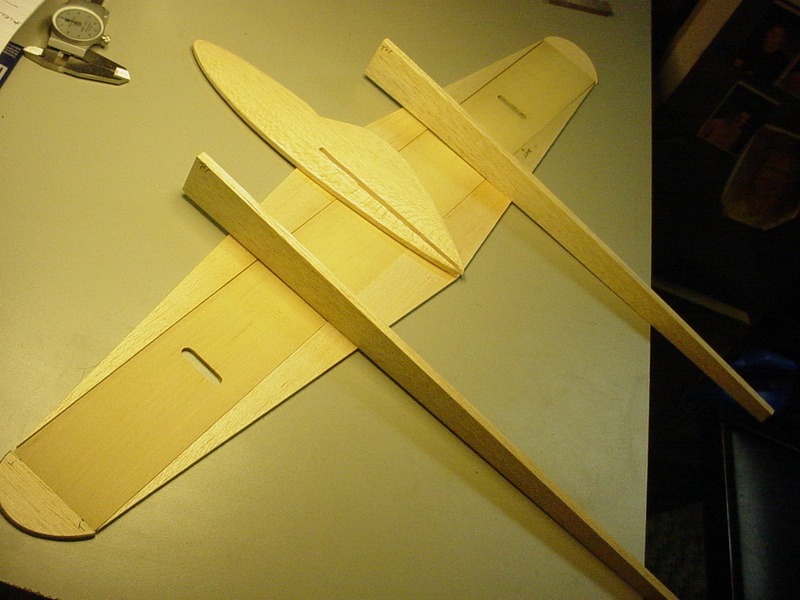 The L/E, T/E and tips are 1/8" sheet balsa. Wing area is right around 100 sq. in. RK Flyer wrote: Hello Roddy!! I am glad to see you starting another project and the P 38 as always been one of my favorites. Hello Richard! It's great to see you back doing some modeling!!! It's ok if you don't fly your models. Building; I find is great therapy.. and I really enjoy it. Regarding balsa.. "this stock" is from an "assortment" that came from Tower Hobbies. I've had it for a LONG time. I hope that Sig comes through for you soon. If you're not looking for airfoiled sheets.. you can find balsa at the "Michaels" and "A.C. Moore" craft stores. They usually have a "Midwest" kiosk/display in the craft-wood department. I shortened the distance between these booms from 10" to 8". It's what's called "fly by the seat of your pants designing".. I almost made them too long before I realized that they're a component of the 19"overall length. I made them 16" long.. and the central pod will extend forward 3" to make the 19" total. I'm watching closely...this may make me bust out my DCPModels Sterling S-14 clone! This was a tough assignment.. It's a little gaffed.. but not too bad. Tail-feathers are next on the list..
Wow. That was quick, and looks very good so far. I will be watching this one! How do I remove a double post? Ready and waiting for the maiden! Looks good. A while back I mentioned a quick and dirty method of feathering the edges of 1/8" sheet balsa by using a "Smiths" type knife-sharpener. It does the job pretty quick.. and it's easy to gage the taper as you draw the sheet through the cutters. 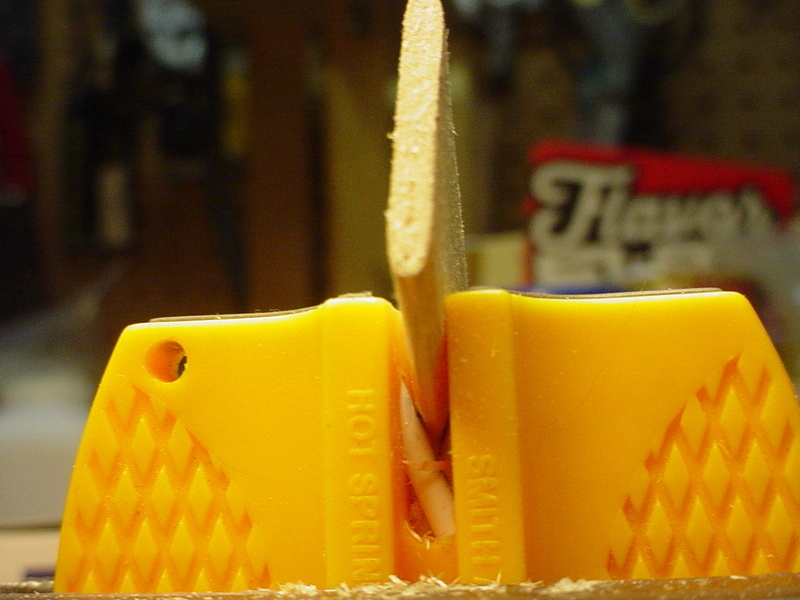 I use the carbide blades to knock-down the edge quickly. After that.. 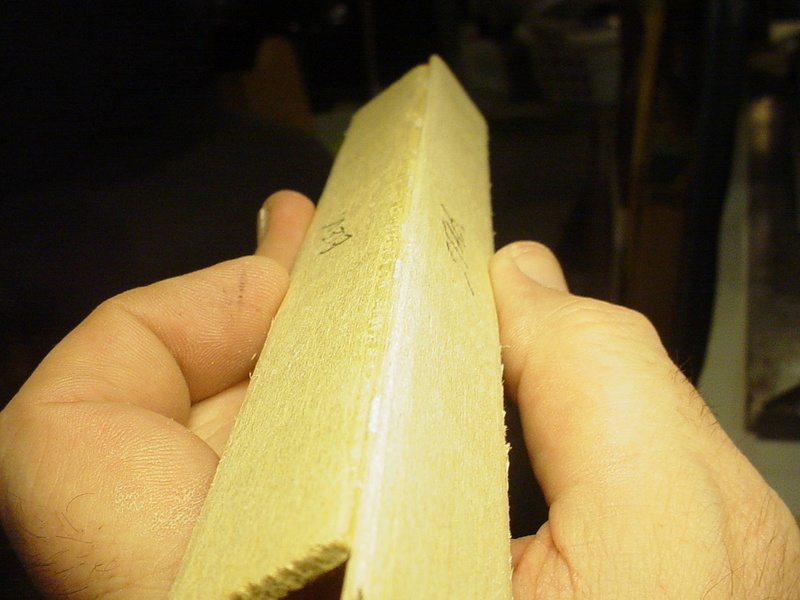 I can smooth the edge with the fine/ceramic rods.. or simply sand with a fine paper. Most of the work is done by the carbide blades. 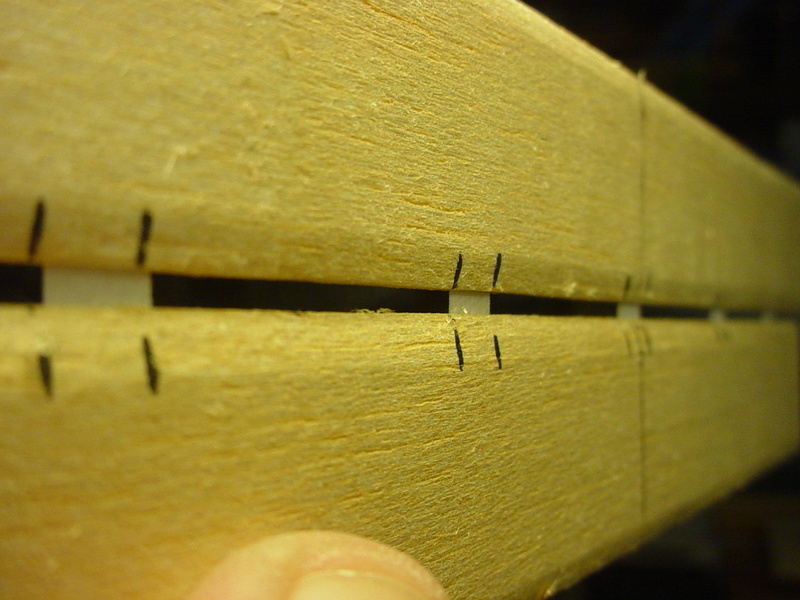 As long as the taper doesn't go "past" a sharp point.. the edge of the piece can be kept even quite easily. Then there's the hinging. 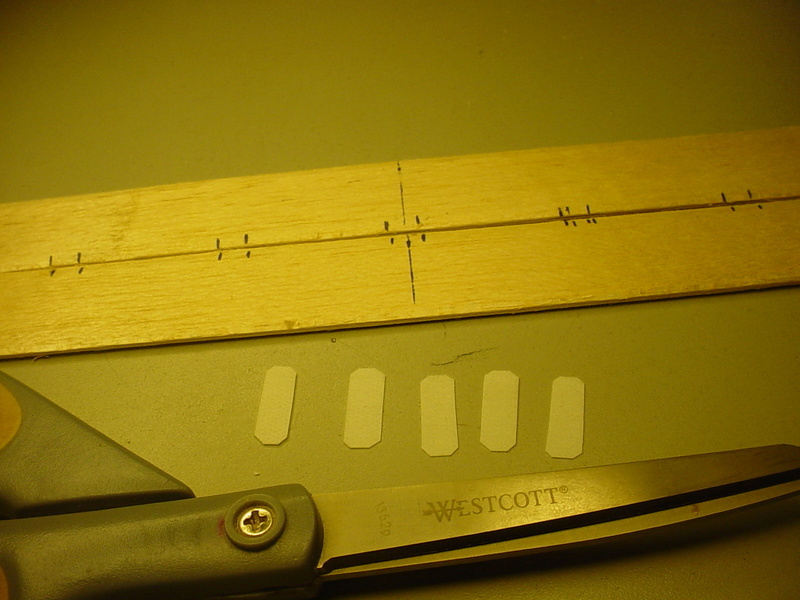 I love this method.. but again; I'm generally hinging 1/8" sheet balsa with "Sig" Easy (CA) Hinges. I use a #17 X-Acto chisel blade which fits the small knife-handle.. and a small piece of 1/16" thick rigid material under the blade to center-it for cutting the slot in the edge of the piece. It also helps to clamp a fence behind the piece. Here; I press-down firmly on the blade with one finger while holding the work-piece down with my other hand. I "rock the blade" as I push inward to a depth that I have pre-measured and marked on the blade. 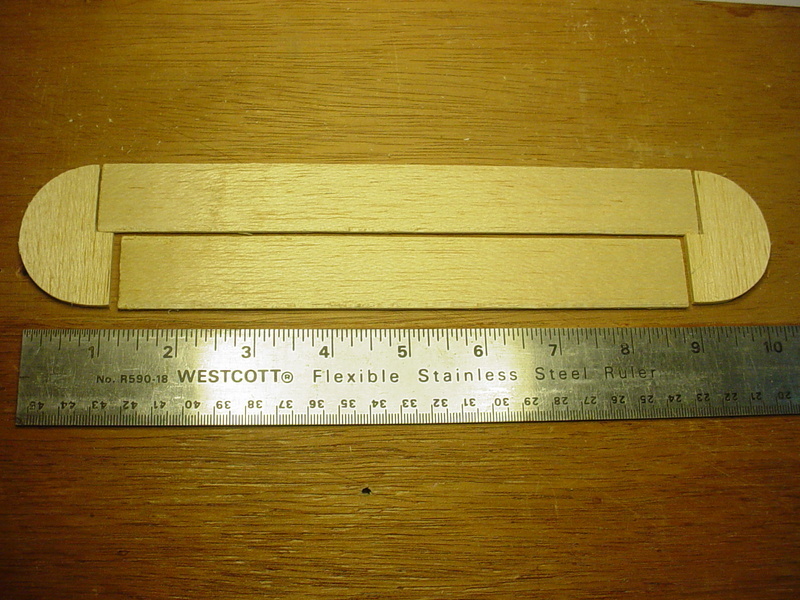 I cut my CA hinges approximately 1/4" wide x 3/4" long.. and then I trim-off the corners with scissors which makes them easier to install. The rudders are shaped "sort of" like an egg-outline.. but somewhat elongated, so I improvised with circle-templates and a French-curve. 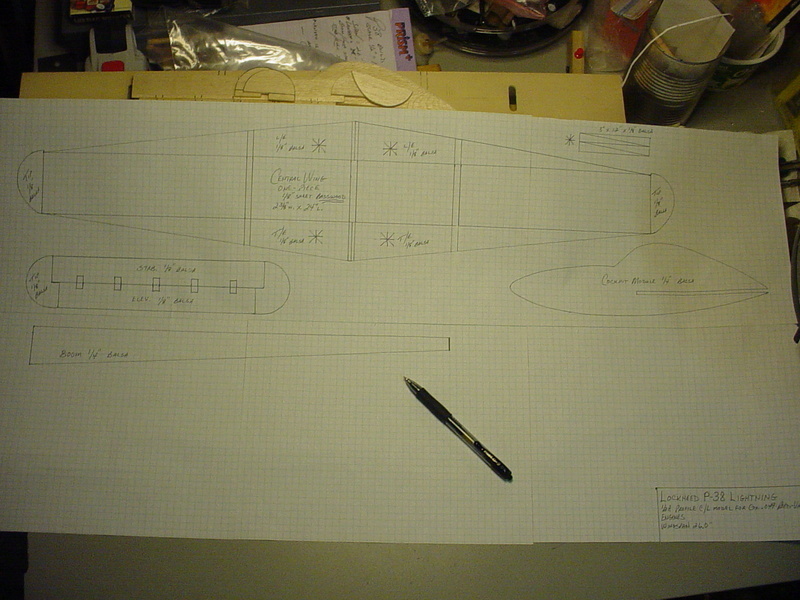 Tomorrow I plan to assemble the wing and slot the nacelles/booms for the wing and stab. I'll probably make the engine-mounts too. Lots of work still to do. 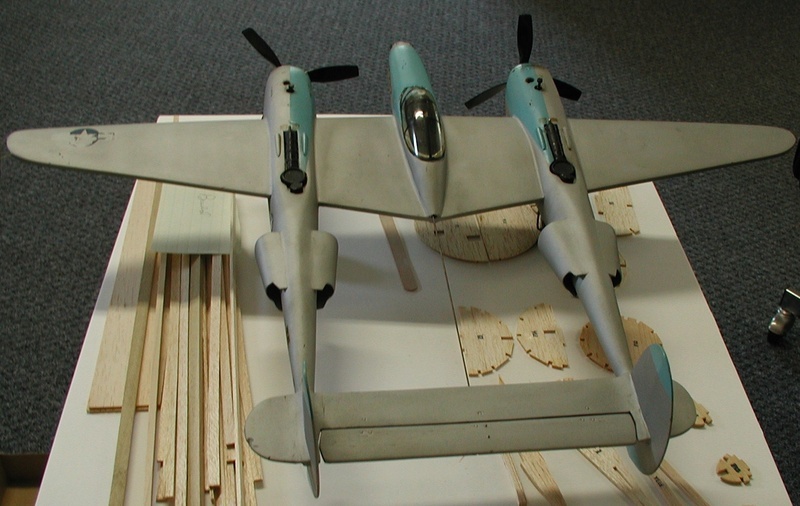 This model will have a scale-like tricycle landing gear. The bellcrank location is undecided as of yet.. but I'm leaning toward mounting it just inside of the outboard (right-hand) nacelle/boom.. and route the lead-outs through the central-pod and inboard nacelle. Cribbs74 wrote: Ready and waiting for the maiden! Looks good. Thanks Ron! It's been a tough last few weeks man. Lynne and I got the flu.. and we're still not completely over it. We didn't really have a Christmas. Didn't put up a tree.. too sick to go anywhere.. or have company.. The only good thing to come out of December was getting that bag of glow engines! I have other unfinished airplanes.. but can't paint anything until the weather warms up. I missed-out on getting a flight in before years end.. That's ok.. I'm still having fun building and tinkering! NEW222 wrote: Wow. That was quick, and looks very good so far. I will be watching this one! Thanks Chancey! I wonder if I scaled this anywhere close to the Sterling design that you spoke of, for the .049 reedies? 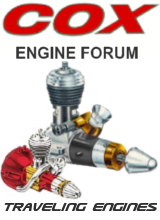 I'm also curious about the dimensions of Bob's (rsv1cox) Golden Bee powered P38..
Well, if you want to know, PM me your e-mail and I will send then to you. I just compressed the folder down for easier sending. Or if any time in the future you need any plans scaled or tiled, please let me know as I have a couple of good programs for that. That's a great start for 2018!! Make sure you keep the cat away! roddie the following measurements are close but not exact. 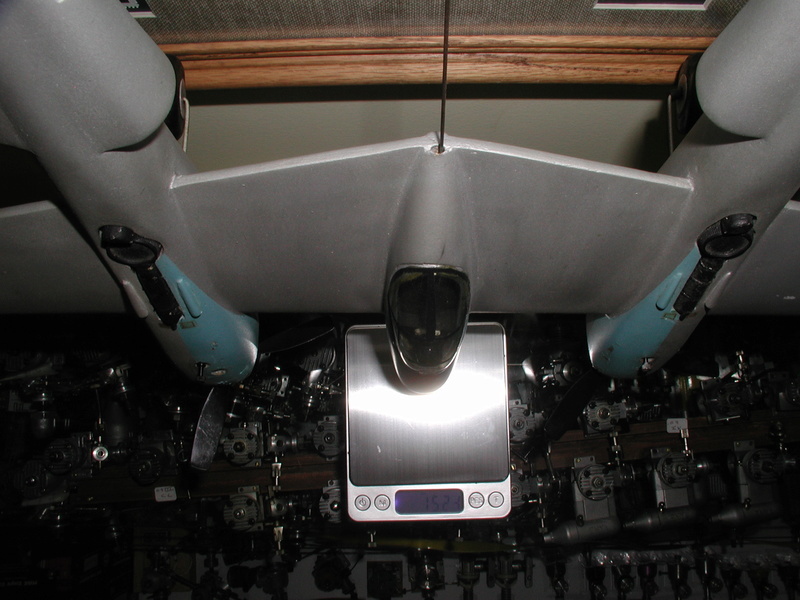 Overall length - 19 1/2"
Twin booms - 16 1/2"
Between booms - 8 1/2"
Wing chord at cockpit - 5 1/4"
Wing chord 2" from tip - 2 1/4"
Cockpit module* - 10 1/4"
Horizontal stab. - 11 1/4 X 2"
Elevator - 7 1/2 X 7/8"
* Pilots module is not to scale, dictated by the canopy that I had on hand. The rest is pretty close as I did not build it exclusively to fly. You would get better flying results by increasing the wing area. Also pay close attention to the built in angle of incidence as with any model. I didn't, that scale thing and as a result mine tends to "mush" through the air. But I have flown it dozens of times and it's still in one piece. I would think that you have captured pictures of it that I have posted in the past, so I won't duplicate them here. Edit add: Between booms is measured center to center (not profile). Enclosed booms were built for Golden Bees, later Black Widows for balance considerations. Still, it's tail heavy and balances near the front of the wing. rsv1cox wrote: roddie the following measurements are close but not exact. Between booms (center to center) - 8 1/2"
Thanks for those measurements Bob! Mine are very close to yours! I really appreciate your taking the time.. and was very curious how they compared. 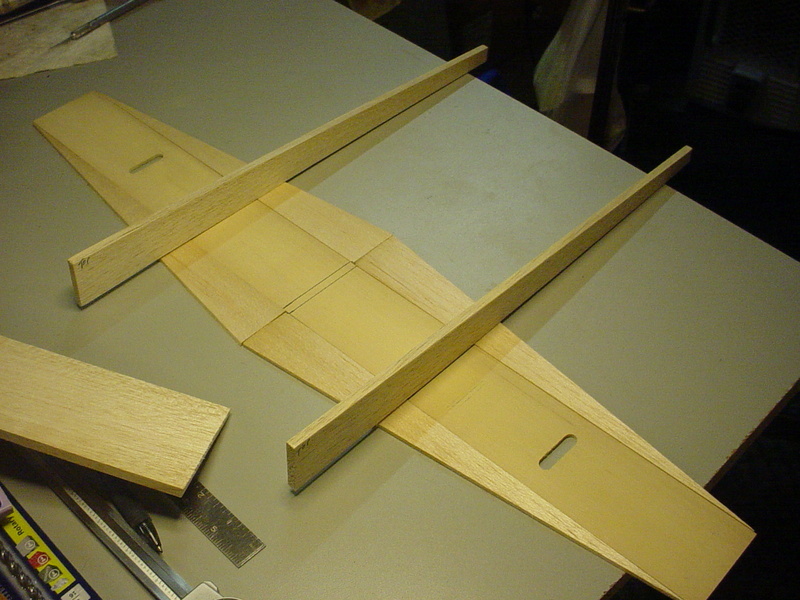 Between booms (center to center) - 8.0"
Wing chord at cockpit - 5.25"
Wing chord 2" from tip - 2.5"
Horizontal stab. - 10.25" x 1.0"
Vertical stab. - 3.625" x 2.0"
Elevator - 7.625" x 1.0"
The wing incidence will be at zero degrees. 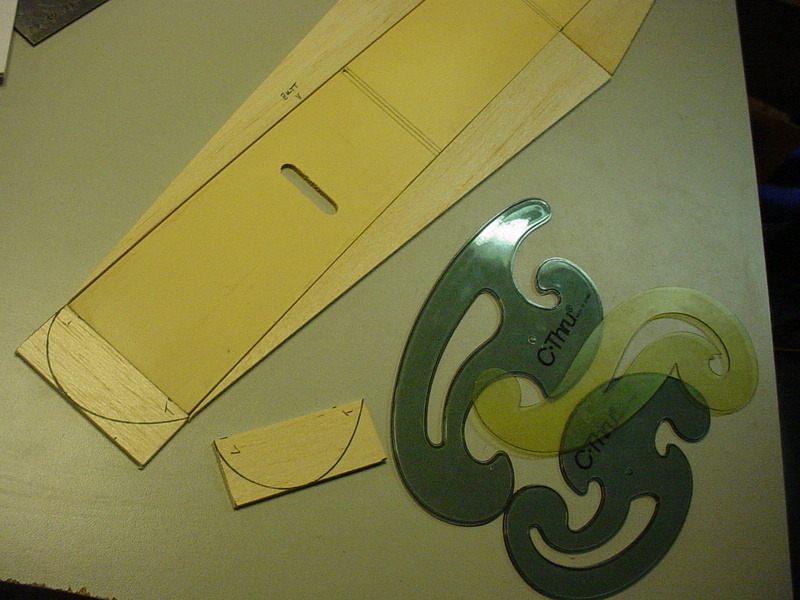 It's a plank/sheet wing as most of my 1/2A C/L designs are. Weight in wood = 3.1 oz. Two Allison .049 product engines (planned) weigh 3.2 oz. so if I can keep the weight close to 10 oz. RTF.. I'll be satisfied. Maybe I'm dreaming..
Looks like the greatest deviation is in the length of the horizontal stab., most everything else is quite close. My biggest regret is not adding the skids on the bottoms of the vertical stabs. Are you going to add the radiator pods and maybe duplicate the turbo's? rsv1cox wrote: My biggest regret is not adding the skids on the bottoms of the vertical stabs. I'm glad you mentioned that. I suppose there is the possibility that they can "scrape" the ground when the nose comes up.. I thought about replicating the mid-boom radiator-scoops..... and probably will. I don't think the model will look correct without them. They won't be anywhere near scale though. My booms aren't as tall as scale-ones would be. 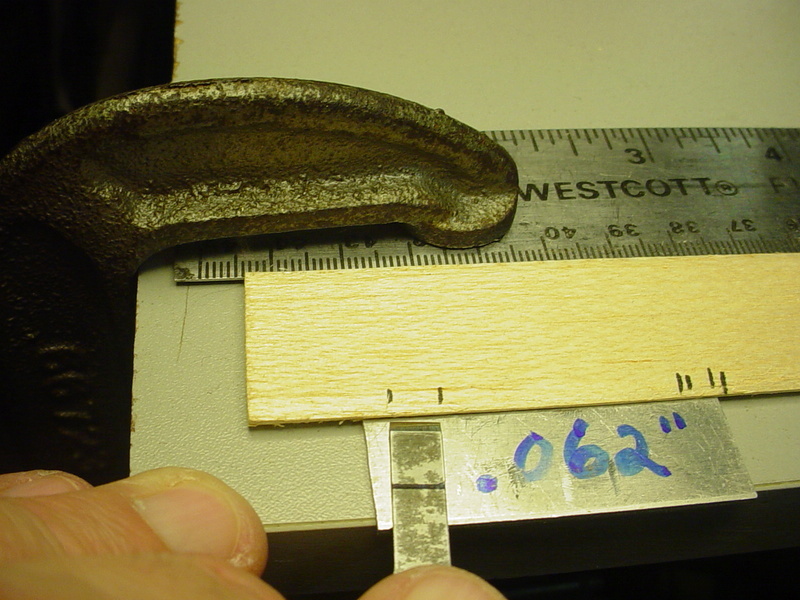 They're actually 1.5" at the engine-firewall; tapering down to 1/2" at the tail. Where this is a profile/slab-wing model; I wanted to apply streamlining to the max.. for creating a more flowing illusion. We'll soon see if that works or not. 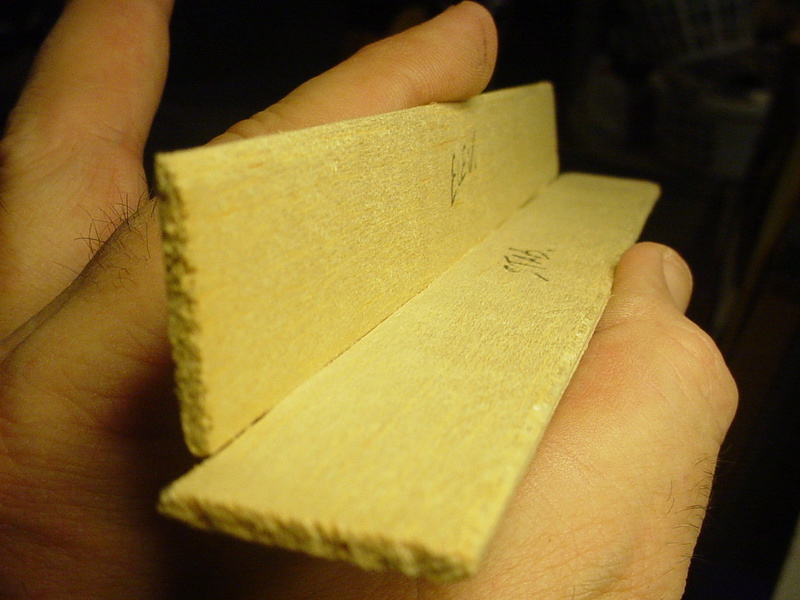 The booms have straight-lines top/bottom.. and still have sharp (non-sanded) corners. I could apply contouring-strips top/bottom later if I have to. I also want to keep weight down. On your model (below photos) I notice that the pushrod is unsupported after it exits the cockpit-module.. all the way to the elevator-horn. Although it looks really slick.. the rod probably flexes excessively in flight when given "up" control-input. You've mentioned the model "mushing" through the air.. and that could very well be the reason. 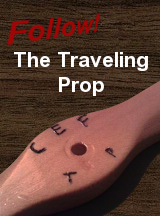 You might be able to remedy this by binding some CF tube with CA and thread to the pushrod, for most of its length. That would be lightweight, simple and should add a lot of rigidity. I know that you don't want to risk flying it again.. but if you make that mod to the pushrod.. you could have Mark test-fly it, to see if there is an improvement. 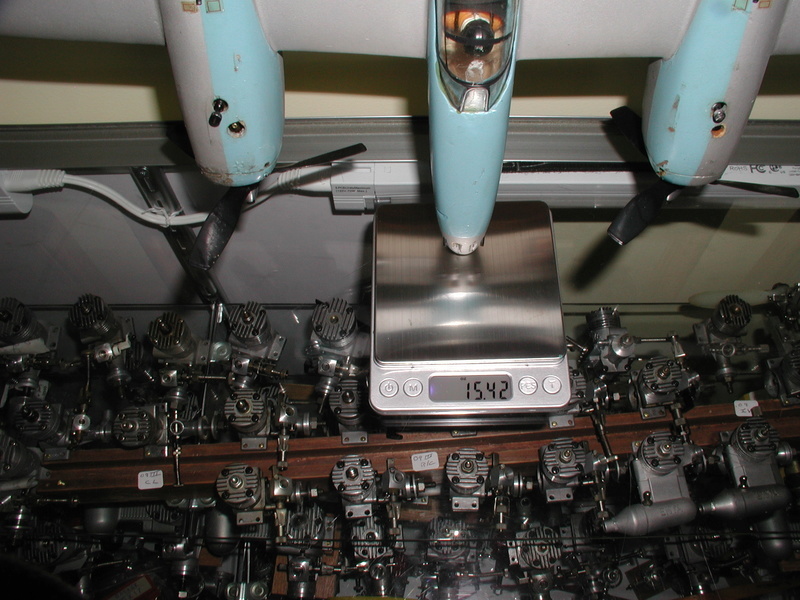 Sent me running to the model to check and photograph the control rods deflection. Yup as I knew, at full up elevator there is a lot of bowing of the rod. Thankfully? 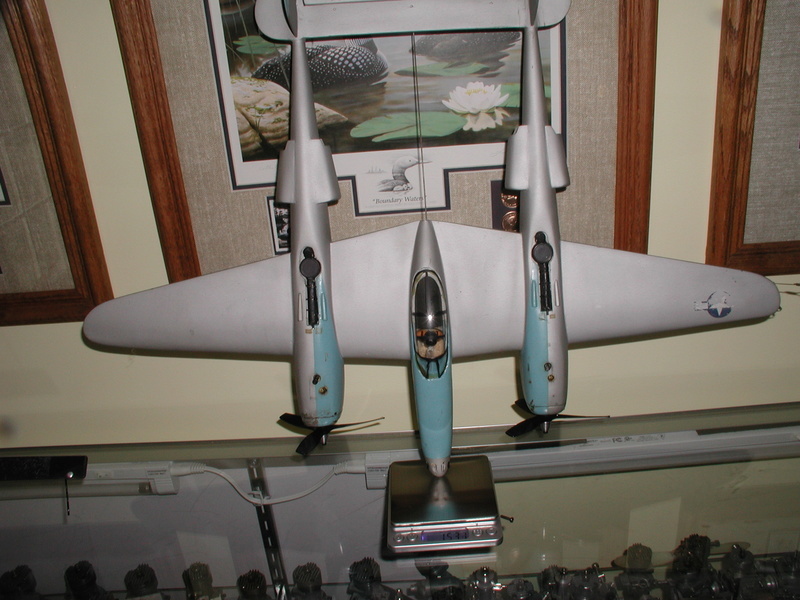 because of the bend with this tail heavy air frame and off-kilter AOI I remember holding a lot of down on the lines so it didn't come into play much. I have never weighed it. A good thing or perhaps I would have never put it in the air. 15.42 oz....that's nearly a pound for those keeping track. I have larger models weighing half as much. That, plus the total wing area makes you wonder how it ever flew..but it did, sometimes on one engine. As mentioned previously, the wing and booms are built up but the module is hollow log. I painted it with Hobby Poxy not exactly the lightest, then there are the add-ons. Circles only, but it was fun to watch and those screaming in-sync BW's and GB's were a treat on the ears. I made a mold for the scoops and pressed wet balsa sheet over them, I had to add non scale supports at the front of the scoops. I used foam, buttons, brass tubing and rubber bands for the turbos. If your looking for the lightest possible model, perhaps you could just draw on the scoops and turbos. rsv1cox wrote: You knew it would happen. It may be heavy Bob.. but it is a beautiful scale model! It's been too long since I've heard the awesome sound of multi's on-song! That's partly why I'm building this model. The other reason is.. I'm finding myself overrun with glow-engines in the last 6 months! I didn't get done what I planned on getting done today.. (story of my life...) but I almost always draw-out a plan as soon as I cut out all the pieces. Sounds a bit backward.. but when I design.. that's the way I do it. To make a full-size drawing for this model.. 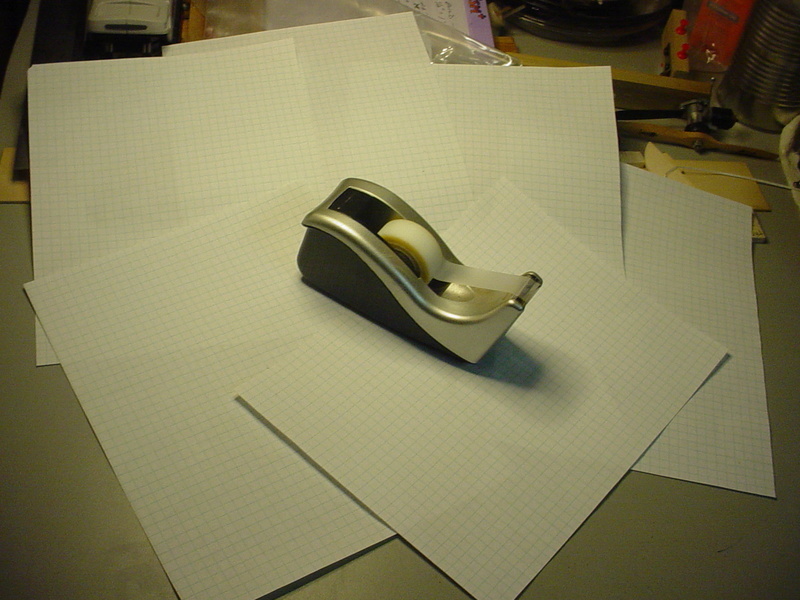 I needed to tape-together six sheets of graph-paper to make a 33" x 17" sheet. If I get too far ahead in the building, it gets more difficult to make the drawing... so I figured I should get started on it. There's a bit more to be done.. but it's a good start. Many of my drawings aren't 100% complete.. but they're all full-size and have the general outlines of the components and material specs. Ken mentioned Medallion .049's for Marks epiphany twin and I agree. Profiles beg for a rail mounted engine. 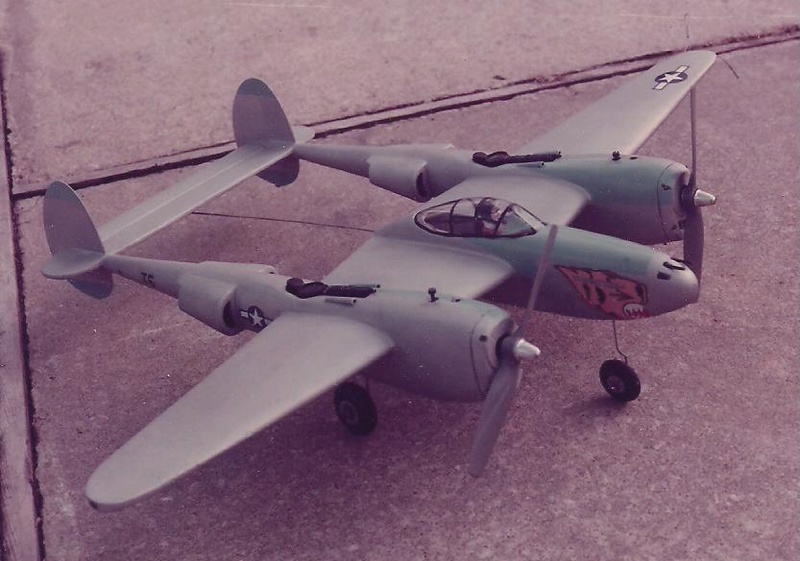 Great start on the P38 , Nice project for when your home bound . I think Bob has a good idea about drawing in some of the components to keep the weight down and make easier for adjustments later in the build ? You may can find the pictures online (print ) and apply to the model ? Just thinking out loud. rsv1cox wrote: Ken mentioned Medallion .049's for Marks epiphany twin and I agree. 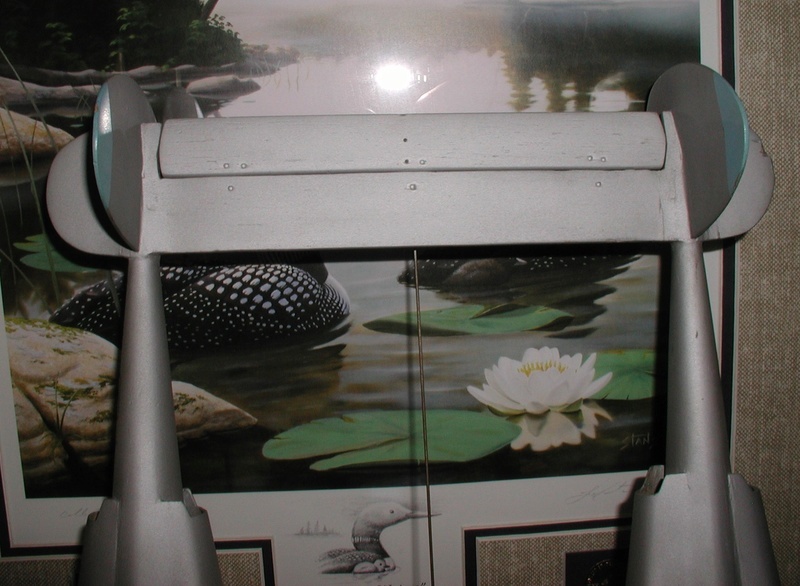 Profiles beg for a rail mounted engine. Oh.. I agree; a pair of Medallion .049s would be choice.. if I had a pair.. My first Medallion engine (.049) came to me just a few weeks ago in that "bag-O-engines" score in Sturbridge, MA. I haven't messed with it yet. It's stuck.. but probably just with castor. It's the only Medallion engine that I have. I do have a pair of Tee Dee .049's.. but they'd be WAY overkill for this model. I have a pair of Testors beam-mount .049's... but I need to get more familiar with how they run before mounting them on a twin. 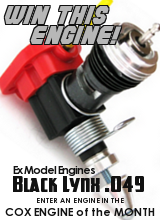 I'm sticking with the Cox .049 reed-valve engines for this model. That will also allow running a combination of R/H and L/H props if I want. I'm trying not to be too "hasty" in the design of the engine-mounts. I won't have too much room for fuel tanks.. if I decide to go with hard-tanks. A central pressure-bladder feeding both engines would be really cool.. but beyond my skillset.